Rubicon will ultimately combine the solid physics/gameplay of Asteroids, the tinkering of Mechwarrior, and- perhaps in the far far off future- the exploration/trading philosophy of Elite and the Escape Velocity series. Once finished, it will be released for free for PC, Linux, and Mac. But I'm getting ahead of myself. Hello! My name is Joseph Perry (developing as Wick), and I am a self-taught game programmer and artist. I'm a college student majoring in something totally irrelevant to developing video games (neurobiology) (HA! That was a joke. Nothing is totally irrelevant to developing video games.). As such, up to this point, I've had to cram any games and the development thereof into all-nighters and weekends. What is this "Kickstarter" thing? Kickstarter is a way for anybody with an idea to obtain the resources necessary to carry it out (or at least get it kick-started). It works by having a whole bunch of different people "pledging" small amounts of money to the project. Pledged funds are only collected if the project reaches its goal within the allotted time- in other words, you only actually give money to successful projects. The amount that you pledge also gets you access to a variety of fabulous rewards (access to beta testing, posters, and the ability to contribute to the project creatively!). For Rubicon, these rewards are cumulative, so you will receive both the reward you choose and all lower reward tiers! But let's chase to the cut. What is Rubicon? I see this upcoming summer and the ascendancy of crowdsourced-based funding as a prime opportunity to really sink some exclusive time and money- neither of which are otherwise available- into Rubicon. I started this Kickstarter project in order to be able to focus on developing Rubicon full-time over the summer rather than working another minimum-wage job to make ends meet (ie, to pay for rent, food). My primary goal is to make working campaign and ship customization modes to frame the already-playable arcade shooter portion of the game. 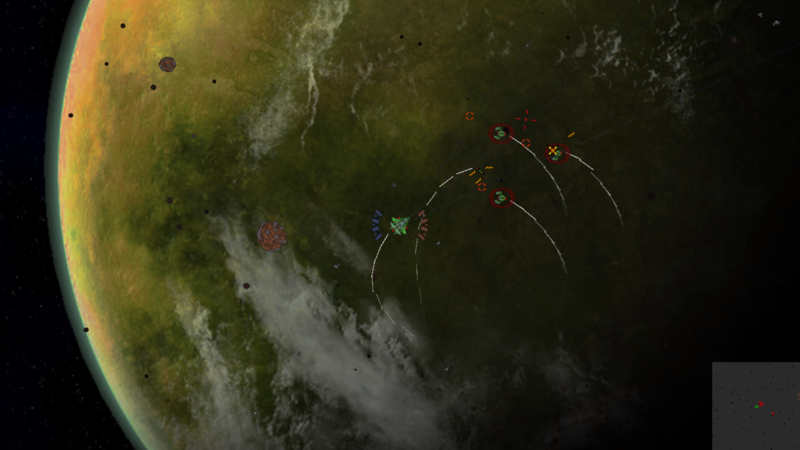 Rubicon will be, at its core, a retro space combat game with a healthy dose of RPG/strategic elements. I want the basic physics and mechanical simplicity of old arcade games like Asteriods or Space Invaders, while retaining the ability to customize, specialize, and optimize ships and strategies akin to the Mechwarrior series. Rather than endless wave after wave of recolored enemies, the game will place you in a variety of situations that no one strategy or ship will be the easiest solution. A single fighter will have a hard time bringing enough firepower to take on an entire fleet of pirates, but your capital ship is going to get pounded into dust if you chase them into that asteroid field. Campaign Mode: Setting up a rudimentary randomly-generated galaxy to explore. I suspect that all I will have time for at this point will be a string of game modes (eg planetary/station/convoy defense/attack, alien evacuation, and salvage under fire) with the ability to modify your ship and squad in-between missions. Ship Modification: Implementing a ship customization system: to give each chassis certain slots and constraints, each weapon power and space requirements, and special systems that confer alternate abilities. Beta Testing: Running an extensive beta testing campaign (see the $8 reward!). I'll be posting to wickworks.tumblr.com with development updates and gameplay videos, and constructive input at all times will be much sought and appreciated. Making more graphics! The pixelated style is the indie developer's best friend (see the $64 and $128 rewards!). Asking/coercing/begging/bribing friends to make some music and sound effects for the game. Have you ever played a game without sound? It's absolutely incredible the difference a little plink makes whenever you pick up a coin. Adding a bunch of new content. Tractor beams, cloaking, mines, gravity distortions, teleportation... I have a bunch of really awesome ideas for how to spice up the game. I'm not doing this for profit- Rubicon will be released for free once it is finished. I want to do it because I love making games, and want to play the game that I envision Rubicon becoming. Your generosity multiplied by the utter magic of crowdsourced patronage will give me the freedom to work on a project that, IMHO, has some real merit. I have the skills and commitment. Note: Rewards are cumulative! You get both the reward you select PLUS all lower reward tiers! The e-mail will NOT contain a bobcat. You get to be a beta tester, and will be listed as such in the credits! Inputting a pilot name of your choice (nothing obscene!) will flip the game to SPECIAL EDITION, where you can choose extra ships in arcade mode, alternate color schemes, special missions, and a bunch more goodies. In other words: your name is a cheat code! I'll snail-mail you a handsome stylized RUBICON poster that you can hang on the inside surface of your living space! You also get listed under "special thanks" in the credits! I send YOU ship art and stats. You can then name the ship, come up with flavor text/the story behind it. I'll then include said text into the game. Capiche? You send ME a ship's doodle/scrawling/concept along with the name and flavour text you'd like it to have. I'll then make the art to fit it into the game. Capiche? The email *will* contain a bobcat. Become a character in the game! I will contact you once I reach the appropriate stage of development, and we'll work out exactly how this will go down.